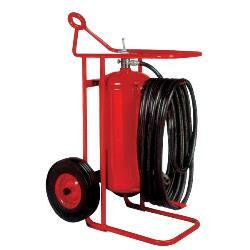 Wheeled Stored Pressure Portable Fire Extinguishers are designed for a single person to operate and can be wheeled through standard doorways easily. These type of fire extinguishers are used in industrial and commercial applications to combat high risk fire hazards. Multipurpose models are suitable for use on Class A, B, and C fires. The Regular and Purple K models are suitable on Class B and C fires.